The Vikings maintain their grip on our imagination, but their image is too often distorted by medieval and modern myth. It is true that they pillaged, looted, and enslaved. But they also settled peacefully and developed a vast trading network. They traveled far from their homelands in swift and sturdy ships, not only to raid, but also to explore. Despite their fearsome reputation, the Vikings didn’t wear horned helmets, and even the infamous berserkers were far from invincible. By dismantling the myths, The Age of the Vikings allows the full story of this period in medieval history to be told. By exploring every major facet of this exciting age, Anders Winroth captures the innovation and pure daring of the Vikings without glossing over their destructive heritage. He not only explains the Viking attacks, but also looks at Viking endeavors in commerce, politics, discovery, and colonization, and reveals how Viking arts, literature, and religious thought evolved in ways unequaled in the rest of Europe. He shows how the Vikings seized on the boundless opportunities made possible by the invention of the longship, using it to venture to Europe for plunder, to open new trade routes, and to settle in lands as distant as Russia, Greenland, and the Byzantine Empire. Challenging the image of the Vikings that comes so easily to mind, Winroth argues that Viking chieftains were no more violent than men like Charlemagne, who committed atrocities on a far greater scale than the northern raiders. 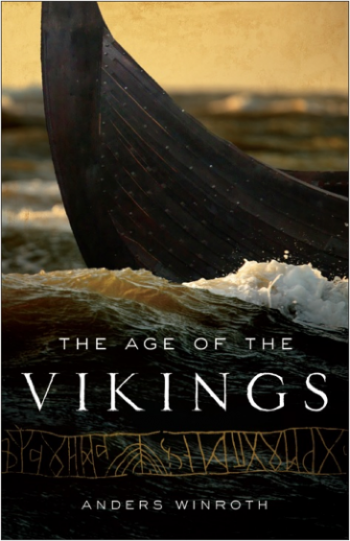 Drawing on a wealth of written, visual, and archaeological evidence, The Age of the Vikings sheds new light on the complex society and culture of these legendary seafarers. [Winroth] has an impressive knowledge of the sources, the archaeology, and the modern historical literature. . . . Winroth really knows what he is writing about, and has done the research. . . . I recommend the work to anyone with little knowledge of the subject and a wish to learn more. Mr. Winroth’s account is superior to all its most recent competitors. He avoids what has become the traditional chronological narrative, centering his chapters instead on themes: violence first, regrettably; but then emigration, trade, state-formation and eventually, with some relief, life ‘home on the farm.’ He also has the happy knack of seizing on a fascinating detail to open each chapter. “[I]nsightful, informative . . . delightful chapters that flesh out our understanding of the Norsemen’s world in a way that no bare narrative could. . . . The Age of the Vikings is a wonderfully compact and fascinating companion to many facets of the Viking world. . . . This book should prove a fascinating and rewarding read for those seeking to deepen their understanding of the Viking world. “I loved this book. … Age of the Vikings captures the wanderlust of its subjects, placing the Vikings all over Europe and the Middle East. Winroth’s Norse aren’t just raiders or farmers, they are merchants, poets, warriors, and sailors. “Winroth has penned a fast-paced, slender volume on the Viking Age designed for general readers….With a style that is vivid, engaging, and brilliant in detail, Winroth skillfully summarizes an impressive body of scholarship not available to most readers. He re-creates the drudgery of farm work to the far-ranging trade in exotic goods, evoking daily life in Viking Age Scandinavia.